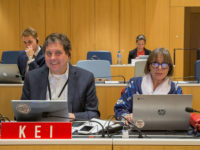 Post Tagged with: "broadcasting treaty"
Good news from Geneva this week where the proposed Broadcasting Treaty failed to generate much support. A diplomatic conference for 2007 is now off the table. Reports from IP Watch, EFF, KEI, and Howard Knopf.